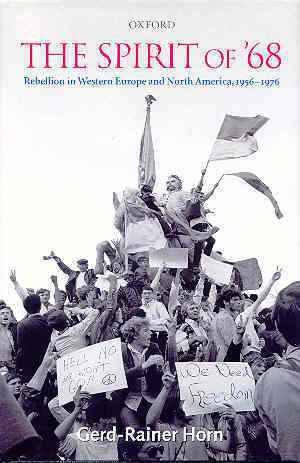 The Spirit of '68: Rebellion in Western Europe and North America, 1956-1976. This book is special: not only did it appear about a year before Sixties-Mania engulfed much of the lit-crit circles in Europe and the United States. It also puts forward an argument that more recent treatments of ‘68’ have neglected; and it does so from an impressively broad geographical perspective, encompassing both the United States and all countries in Western, southern and northern Europe. Horn’s primary research in archives, journals and pamphlets and his analysis of research literatures in no less than six languages (English, French, Dutch, Spanish, German, Portuguese) puts the linguistic poverty of much (if not all) Anglo-American research on this topic to shame. Moreover, his account is also much more detailed and factually grounded than comparable overviews, such as Ingrid Gilcher-Holtey’s pastiche on the sixties in Western Europe and the USA. Horn’s chronological reference points are more explicitly political than those of other authors: he begins in 1956 with the Suez Crisis and the Hungarian uprising and ends with the termination of Italian wage earners’ successful battle for the control of their workplace and the Portuguese Revolution of the Carnations in the mid-1970s. This wide-ranging chronological and geographical perspective enables Horn to uncover a key element of the 1968 protests that many other recent accounts have tended to neglect. Whereas the historical mainstream now paints ‘1968’ in the mellow tones of a pre-Raphaelite painting that shows the almost natural flow of generations, carried by a shift towards ‘post-traditional’ values, Horn’s narrative is similar to an inspiring (and frequently polemical) Situationist-type happening. He emphasises the explicitly political character of ‘1968’ as a historical moment that ‘opened up possibilities that fundamentally questioned the social, political, economic and cultural status quo’ (p. 231). Horn’s argument profits from the author’s refreshing personal political commitment to the issues discussed in this book, for example when he refutes unnamed ‘establishment pundits’ (p. 2) or when he expresses his hope for a revival of popular protests around these issues in the twenty-first century in his conclusion. Throughout his crisp and engaging account, Horn stresses that ‘culture’ and ‘politics’ cannot be separated analytically and thus, paradoxically, ends up supporting Marwick’s thesis of cultural norms as the driving force of political protest in the 1960s. His story begins with the formation of the Situationist International and the beatniks, hipsters and existentialists. He then takes the reader through a staggering amount of material with great ease, covering student activism, the working-class dimension, varieties of ‘the Left’ and the meaning of ‘1968’ in chapters 2 to 5. His remarks on the Belgian movement are fascinating as is his gripping account of the 1962 strike of the Mieres miners and the creation of workers’ commissions in Franco’s Spain in 1962. Horn also brings out important connections and conjunctures between the different student and workers’ movements in the various countries. There are only few obvious factual errors in the narrative, although subsequent editions of the book should note that Anthony Eden was not the British Foreign Secretary, but Prime Minister at the time of the Suez Crisis (p. 132); and the demonstration on 13 May 1968 is unlikely to have been the largest that Paris had ever known (p. 105), although it might well have been the largest post-1945 one. Two general points merit further discussion, however, as they might help to highlight some general assumptions that most research on ‘1968’ in Western Europe has not yet properly tackled, although US research is conceptually much more advanced. It is Horn’s significant achievement to have brought the political drama of movement activism out so clearly and to have shown the fluidity of the framework of Cold War politics. Problematically, however, apart from a few references to participation, liberation and emancipation, Horn never gets down to the fundamentals of what he means by the ‘spirit’ of ‘1968’. One occasionally gets the impression that, for Horn, ‘spirit’ has not only been a description of the feelings and aims of the protesters, but fundamentally a philosophical concept. This reviewer could not help noting certain similarities to an interpretation of ‘spirit’ that suggests an underlying historical structure akin to Hegel’s Weltgeist, that Horn interpreted from a pronouncedly left-wing perspective (for the thunder of cannons at the battle of Jena and Auerstedt read the street battles and contestations around the world around 1968). This conceptual move allows Horn to read the manifold and quite distinct and different protests in the USA and across Western Europe as an unfolding dialectic and thus as part of the same historical structure of opportunity. The important historical question is, however, whether strikes and peace movements can really be analysed within the same analytical framework. Are not, as Belinda Davis has recently highlighted, the processes of mobilisation and subsequent experiences of activism in the loosely organised social movements and much more firmly organised trade unions so different that we cannot really analyse them adequately through the prism of the same analytical framework or ‘spirit’? Horn admits as much at the end of his study, where he differentiates between a worker-centred ‘68’ in southern Europe and movements driven primarily by the middle-class in western and northern Europe as well as in the USA. He also recognises that an important shift from workers to middle-class intellectuals and students characterised the origins of the New Left in most Western countries. Likewise, Horn’s emphasis on the links between ‘politics’ and ‘culture’ form an important step in this direction, but the theme is not followed through consistently. Nevertheless, Horn did not really incorporate this insight into the conceptualisation of his study. In particular, some of the implications of this observation are given rather short shrift. Thus, the role of the mass media for movement politics receives only scant attention. And the rather ambiguous interactions between counter-cultural trends and mass consumer societies does not really appear as an issue in Horn’s narrative. Although Horn discusses the Situationists and the Beat movement, his remarks on these fringe groups sit rather oddly with his narrative on trade-union activism, and only make sense if one excepts that they are the expression of the underlying spirit against ‘non-alienated life’ (p. 23). A second and related problem is, therefore, that Horn is slightly weaker on the history that followed in the late 1960s and early 1970s. In the end, Horn implicitly seems to adopt a definition of the ‘political’ as essentially economy- and class-based which may not be adequate for the highly complex and differentiated Western societies of the 1960s and early 1970s. Geoff Eley and Keith Nield have made an important contribution to this issue in their recent work on the relevance of the category ‘class’ in history. As Horn has not really engaged with these questions explicitly, he is not really able to discuss the impact of the various social movements systematically and account for the different trajectories of phenomena and movements as diverse as political violence, ‘new feminism’, peace and ecological movements as well as gay liberation movements, to name but a few. Nor is he able to say much about why across many of the countries he has studied the conservatives seem to be the ones that were able to cash in on ‘1968’ and presented themselves as the true champions of ‘democracy’ by pointing towards often dubious threats. Given the breadth of his account, this limitation is understandable, but heuristically this move leaves Horn with a gap in his argument. Nonetheless, his book is a superb and provocative addition to the literature on ‘1968’ which will hopefully find its way onto undergraduate and post-graduate reading lists as a reliable standard work on the topic. No-one working on post-1945 history will be able to ignore it. Given the depressing library allowances that many UK history departments have to live with and given the equally stiff $75 price tag of the book’s US edition, it is good to see that OUP has decided to publish a reasonably priced paperback version of the book this autumn. Ingrid Gilcher-Holtey, Die 68er Bewegung. Deutschland, Westeuropa, USA, München: C.H. Beck, 3. Aufl., 2005. See, for example, Arthur Marwick’s empirically unreliable The Sixties: Cultural Revolution in Britain, France, Italy, and the United States, c. 1958–c. 1974, Oxford: Oxford University Press, 1998; as well as Norbert Frei’s generational narrative 1968. Jugendrevolte und globaler Protest, München: dtv, 2008. See Geoff Eley’s points in his review essay in Journal of Social History, 38, no. 3 (2005), S. 776-780. See the account in Rudolf Haym, Hegel und seine Zeit: Vorlesungen über Entstehung und Entwicklung, Wesen und Wert der Hegel'schen Philosophie, Berlin: Verlag von Rudolph Gaertner, 1857, S. 257; as well as the (in this context) highly interesting reception of this theme by Alexandre Kojève, Introduction à la lecture de Hegel. Leçons sur la phénoménologie de l’esprit, Paris: Gallimard 1947, S. 109. Belinda Davis, What’s Left? Popular Political Participation in Postwar Europe, in: American Historical Review, 113, no. 2 (2008), S. 363-390. For an alternative approach see, for example, Francesca Polletta, It Was Like a Fever. Storytelling in Protest and Politics, Chicago: University of Chicago Press, 2006. See the important contributions by Stephan Malinowski and Alexander Sedlmaier, ‘1968’ als Katalysator der Konsumgesellschaft. Performative Regelverstöße, kommerzielle Adaptionen und ihre gegenseitige Durchdringung’, in: Geschichte und Gesellschaft 32, no. 2 (2006), S. 238-267; Detlef Siegfried, Time Is on My Side. Konsum und Politik in der westdeutschen Jugendkultur der 60er Jahre, Göttingen: Wallstein, 2006. Geoff Eley / Keith Nield, The Future of Class in History. What’s Left of the Social?, Ann Arbor: University of Michigan Press, 2007. Holger Nehring: Rezension zu: Horn, Gerd-Rainer: The Spirit of '68: Rebellion in Western Europe and North America, 1956-1976. Oxford 2007 , in: H-Soz-Kult, 13.10.2008, <www.hsozkult.de/publicationreview/id/rezbuecher-8653>.